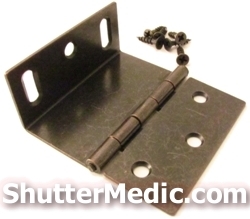 Order Wrap Around Shutter Hinge (2 1/2" x 1" x 1"). 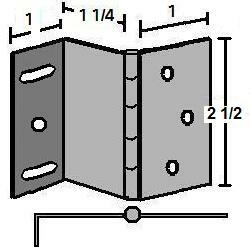 Wrap around hinges are used when installing shutter panels inside window opening. The return part of the hinge wraps around the back side of the shutter panel and is normally attached to mount strip which itself is attached to the inside of the window casing. Hinges were exactly as described. Just what I was looking for. Excellent quality. Would definitely recommend. The new hinges matched the existing shutter hinges perfectly. They worked exactly as anticipated. Great product. Customer said, "Perfect!" Great people to work with. Will use again!